Time for salat and you want to just slip into something really quick? 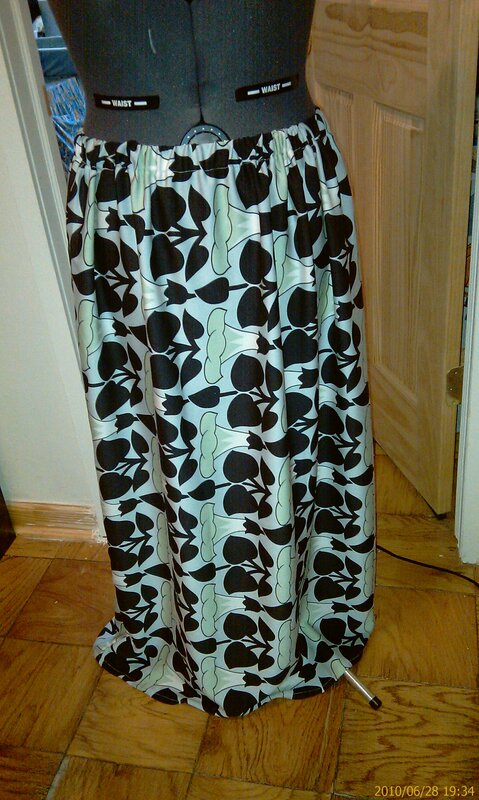 Here is a really easy and simple skirt to make for your salat. 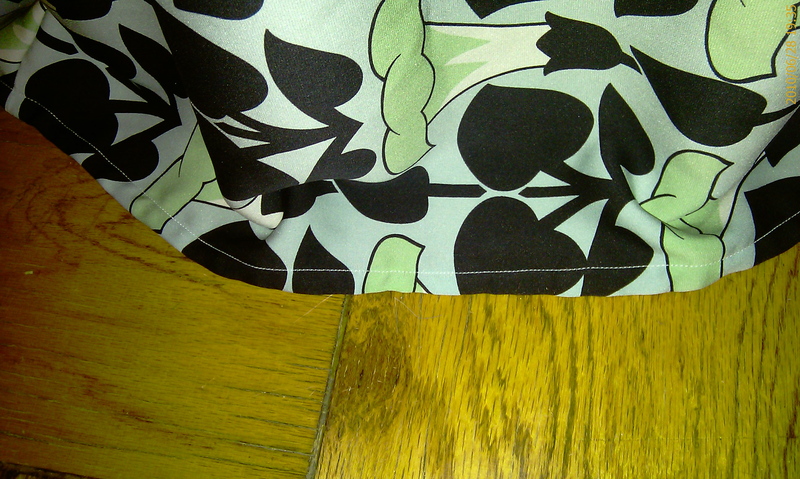 **QUICK explanation- RIGHT SIDE = the outer fabric, the side of the fabric you see on the outside. 1) Measure your waist, where you prefer your waistband to sit, tie something around this area and write down this measurement. Next measure the length from your waist to your ankle. To make this easier, ask for assistance, if you don’t have that extra hand stand in front of a mirror, hold one tape end to the tie on your waist and step on the other end and read the measurement from the mirror. Write down this measurement. 2) For beginners, it’s best to use cotton fabric, it’s easier to handle and for this project cotton is suitable. Make certain that all your edges are even, to do this, snip a raw edge and tear. It’ll tear on a straight grain. Selvage is a factory finished edge that keeps the edge from fraying or unraveling. That edge will be even so even out the edge that was cut at the fabric store. My fabric was a test fabric that was given to me by a teacher at F.I.T. and it wasn’t printed on a straight grain. I’m working with my patten on it’s side. I’m not using this outside, it’s for in home use only, it’s not a big deal. This way I don’t waste this fabric. 3) Fold fabric on half, right sides together, so that you have a lengthwise fold opposite a lengthwise raw edge, pin the edge together. You should have your waist measurement here plus an extra 5-10″. 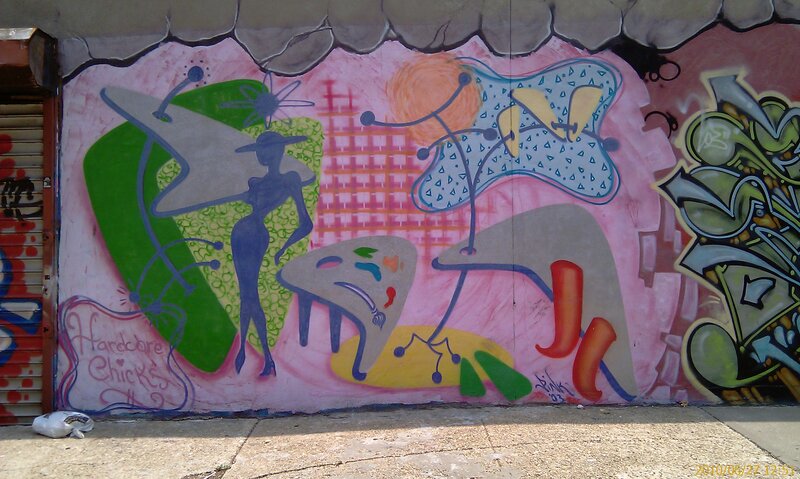 What ever the extra is, keep it, it’ll just add gathers in the end result. Just make sure that you don’t have your exact measurement, if that’s the case, take some fabric off the length and add it onto the side and this will give you width. 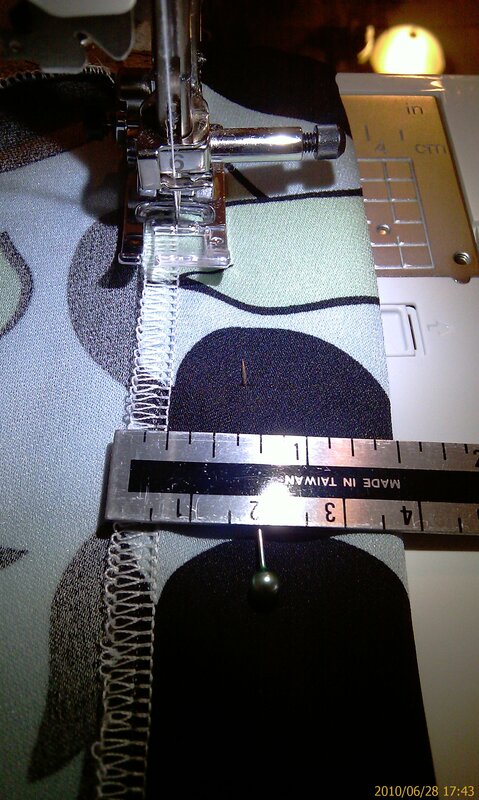 4) Sew a 1/2″ seam allowance removing the pins as you go. 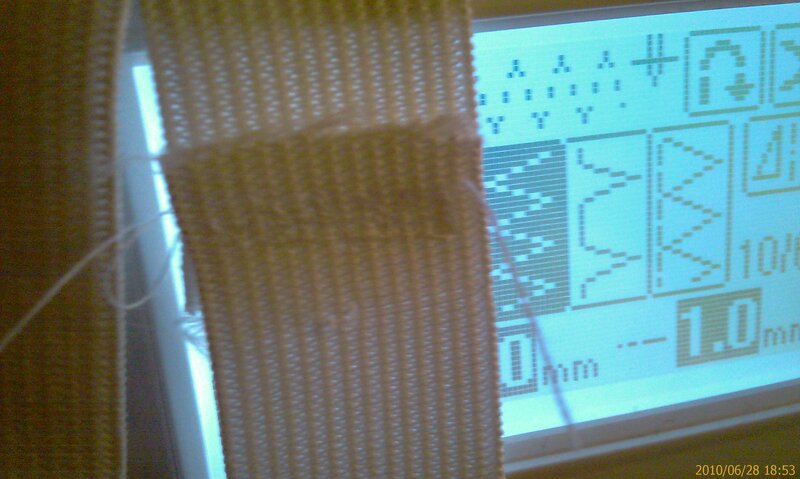 Don’t forget to backstitch at the start and finish of the stitching. 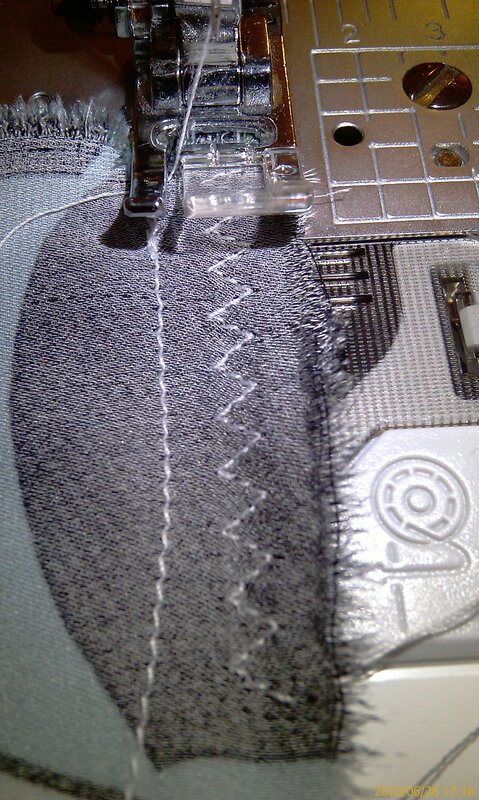 Next, to keep the fabric from fraying do a zigzag stitch along all your seams. 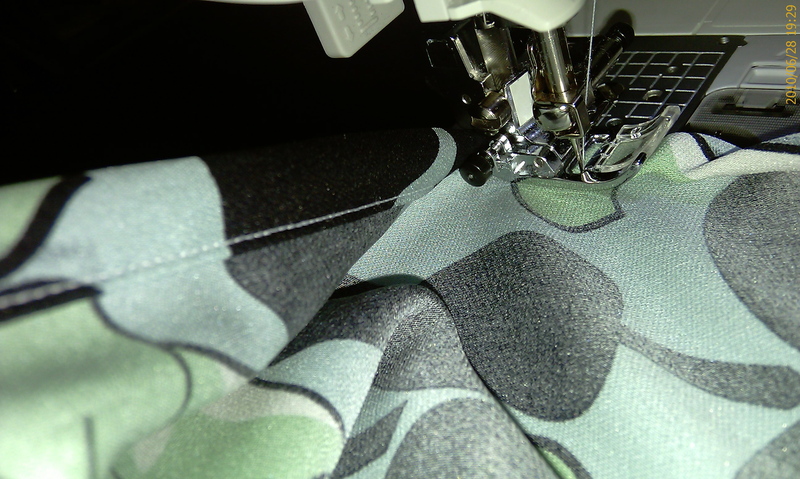 If you have an overlock machine (serger), serge along all your edges now. 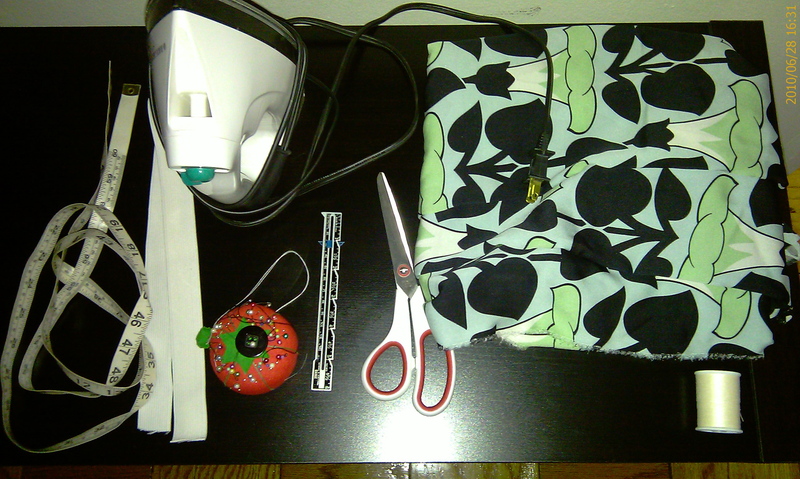 5) To make the waistband, fold the top of the skirt edge in 1 1/2″, wrong sides together, iron and pin. 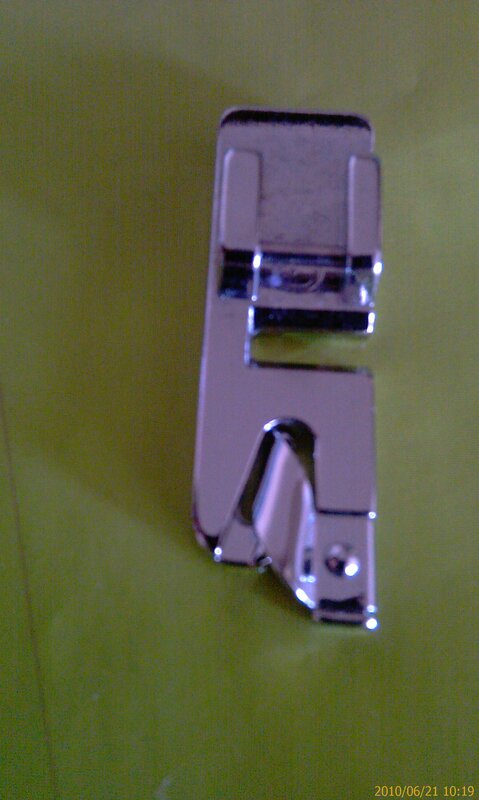 Sew 1/4″ in, leave an opening of 2″ for the elastic to be inserted through. 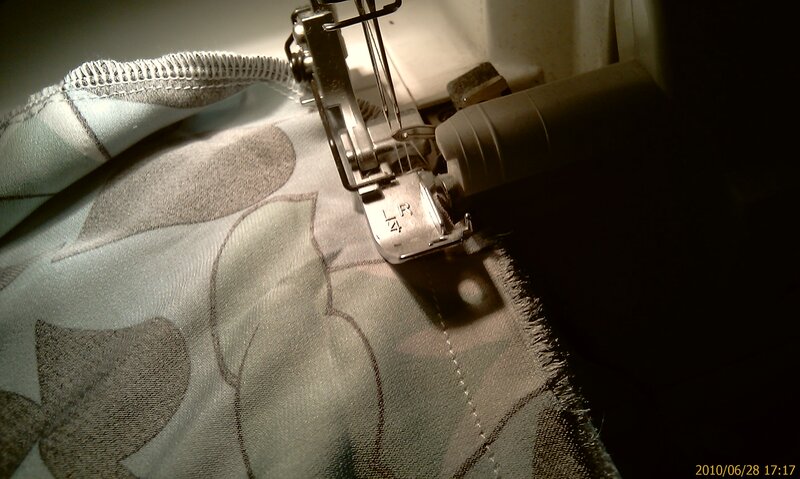 6) Thread elastic through the 2″ opening, you’ll have to gather and pull the fabric as you do this. 7) Stitch together the ends of the elastics using the zigzag stitch. 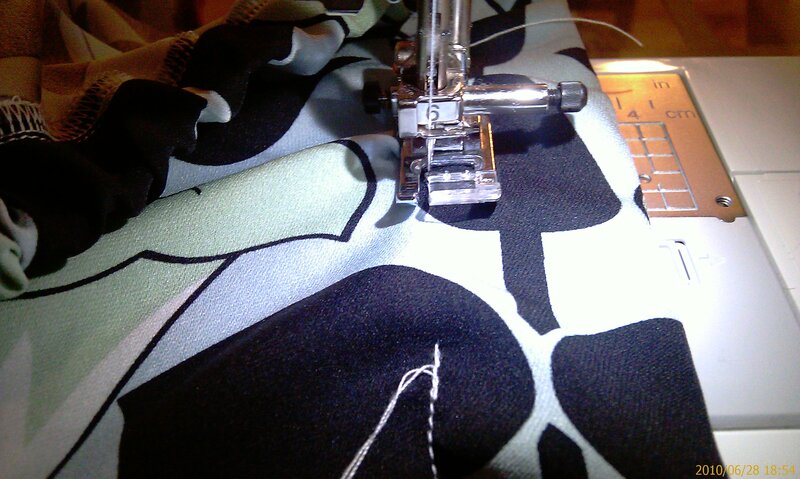 Overlap 1/2″ and stitch over twice to secure. 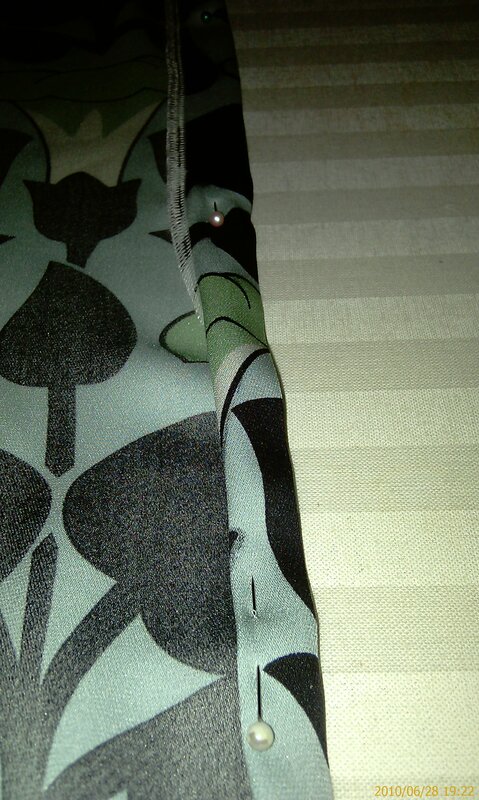 8 ) Close the 2″ opening for the elastic now by topstitching. 9) Take your length measurement and add an extra 2″ to it. 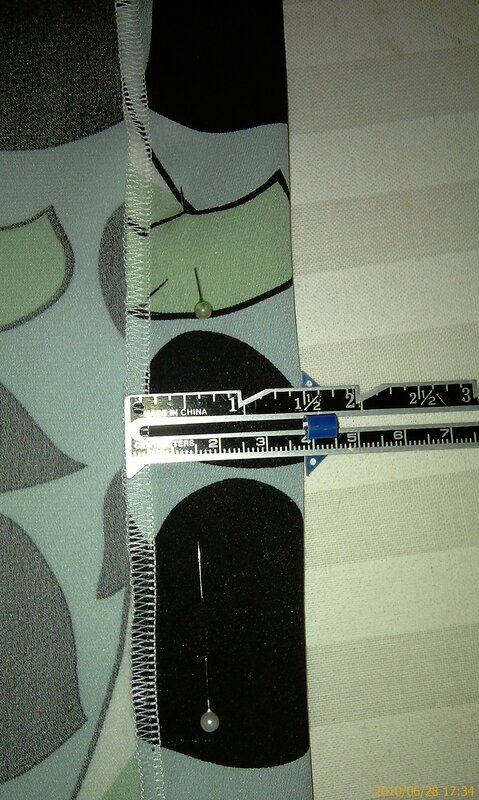 1″ for the hem and 1″ for any mistakes, you can hem it up again if need be. Cut off any access fabrication. Next hem up 1″, pin and iron. Now take that 1″ and turn it in 1/2″ and re-pin. Where you can find mine!! 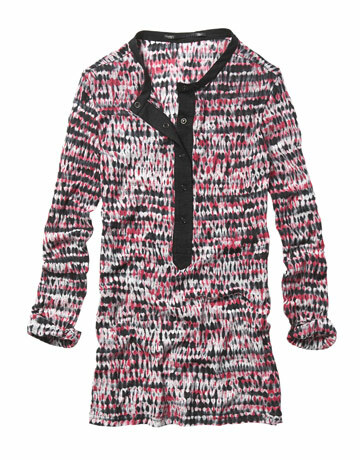 I designed this tunic for myself as I need some fun and cute outfits for my upcoming trips. I bought this lovely lace one day when we went to a flee market. They have fabric vendors there, and that’s what gets me all excited, and I force hubby to take me. 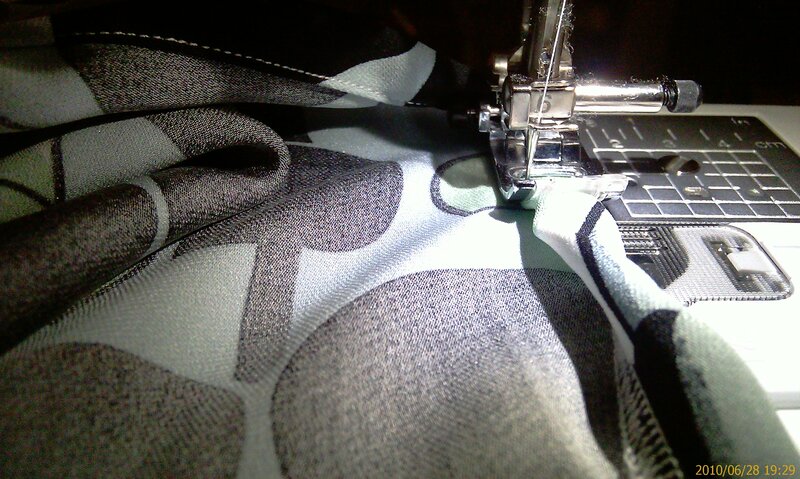 A lot of times I don’t like the fabric, but I still like to go. This time I got lucky, and I found this blue lace. 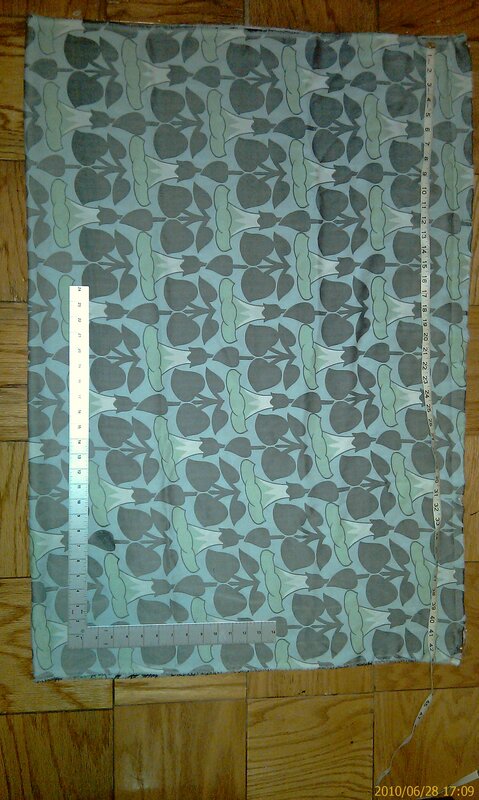 I chose a forest-y green fabric for the lining. So in the next few weeks I will be making it. Stay tuned! Today I had an important appointment in the city. The question since last night was, what do I wear??? I do this anytime I have to go anywhere, I think the night before, the morning of and sometimes I stress over it!!! I know to some people it’s silly, but to me, it’s a part of my life. So my final decision was made 30 minutes before we left the house. 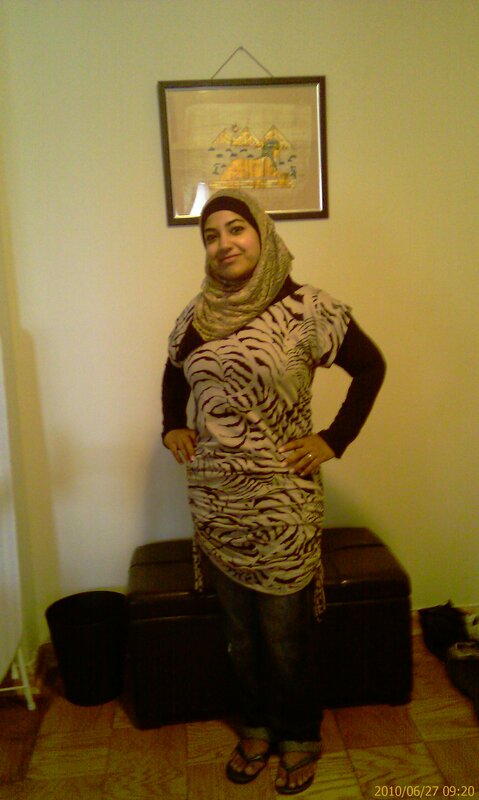 I wore this dress, (I wear it as a shirt) I bought it from New York & Co., the jeans are also from NY & Co (you can’t really see them here), the black hijab is old it’s from one of my abaya’s my mom bought for me ages ago and the beige hijab I bought from http://www.pearl-daisy.com. This isn’t a tutorial, I promise I will do one soon. I’m just sharing some of my hijab’s that i’ve made over the years. 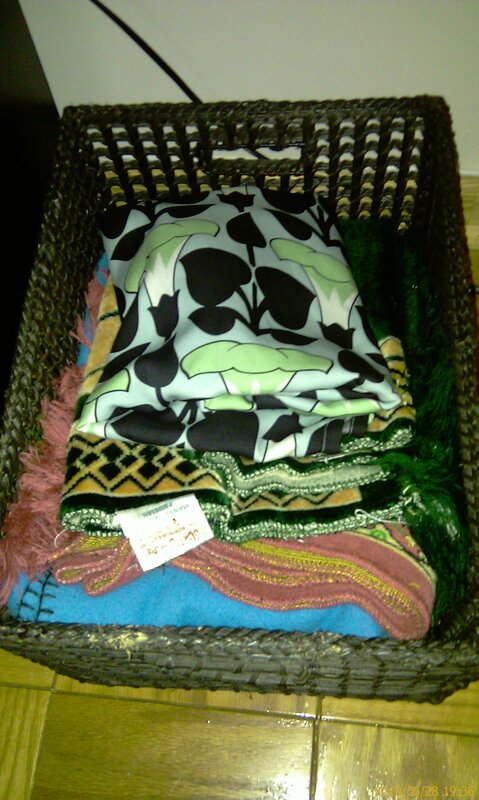 Majority of the time I only buy a yard of the fabric that I will use to make into a hijab. The first hijab finish is called a narrow edge hem, and I’ve included a picture of the presser foot that I used to make that finish, it’s called the narrow hemmer foot. The second hijab that I show you, I jumped from one thing into another and so this is what I meant, I took the bottom of the width off and added it to the side edge. I did that to make the hijab longer and so that edge would be hidden. Also, I know I keep saying I iron in an inch and then I turn that inch in so it’s half an inch. I think I’ve confused many of you!! Sorry, I forget that not everyone sews and understands what I’m saying. So when I do a video tutorial, i’ll show you what I mean. I mention that with the knit hijab you can’t machine sew it, that’s not true, in my opinion it wouldn’t look nice and neat, so I hemmed it by hand. This was my first video and I was nervous and it wasn’t rehearsed! lol…I hope I helped somewhat! Next video will be much better!!! PROMISE! I sometimes just go shopping just to admire clothes. Today is officially the first day of summer and we hijabiz want to style it up too! 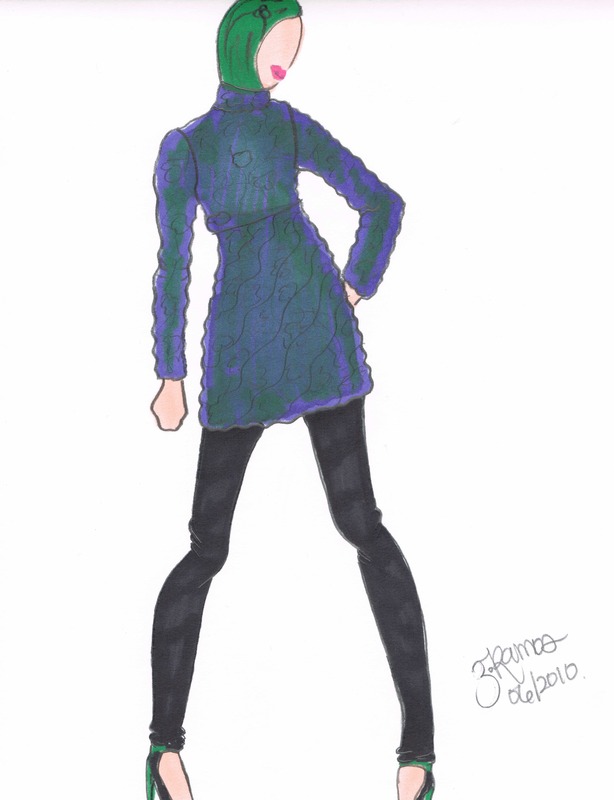 I get a lot of inspiration from other designers and sometimes think that hijabi’s influence designers as well. With the layering, the maxi dresses and skirts. Sometimes when you search hard enough, you can find great pieces that you can mix and match. 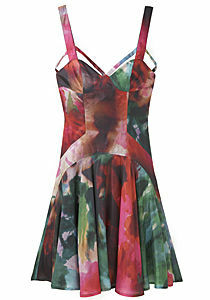 You may find the perfect dress(short) which I do a lot, just ask my husband!! I substitute dresses for shirts or blouses all the time. I like the coverage, as long as it’s not too long, because you have to balance it out. 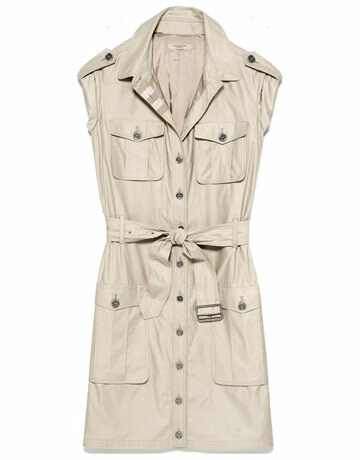 Wear it just above the knee with skinny jeans or trousers. I picked out a few looks here that can be hijabified. Add a long sleeved T, a blazer if you like, skinny jeans, trousers or a light cardigan and there you have it. The fun thing for us is that we can have many different looks with one dress. Just switch up the hijab, or change the bottom. Don’t be afraid, have fun, experiment, we are UNIQUE!! !